In the northern hemisphere, an outdoor cultivation space for cannabis should always be oriented to the south, and the opposite for growers in the southern hemisphere where outdoor cultivation spaces need to be oriented towards the north. The hours of solar incidence (hours of direct sun), it’s always better to have more. Less than 4-6 hours of direct sun exposure will negatively affect plants, especially the production of buds. An outdoor cannabis grow should be well protected from the wind. Given the structure of the plant, especially when it is developed and in flowering, it shouldn’t be exposed to strong winds as there is a danger that some branches will break or bend. If the impact of the wind is unavoidable, a good system of ties and supports to hold the plants is great help. It’s a good idea to have a plan to protect against pests and diseases that may affect our crop, so we can anticipate any possible incidents. We can use some of the many phytosanitary products that are available on the market, or opt for more preventive strategies with less impact on the plants, such as sacrificial “trap” crops, for example placing tobacco plants among our grow to attract pests and prevent them from infesting the cannabis plants. 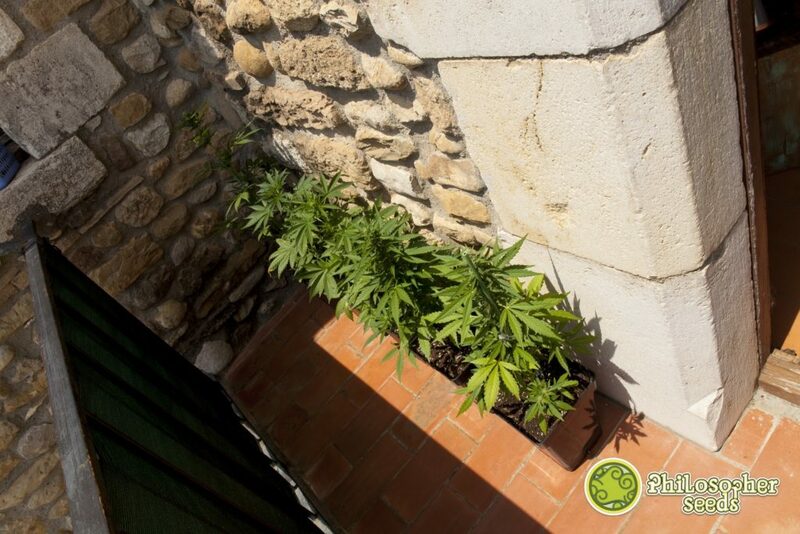 Another important factor in protecting our crop is the discretion and concealment of our cannabis plants. It’s always better to avoid prying eyes, especially those of rippers, nosey parkers or the authorities. If we need discretion, it’s advisable to look for varieties with an indica structure, robust, wide and of shorter in height than stretchy sativa varieties that grow taller and tend tohave a longer flowering period. 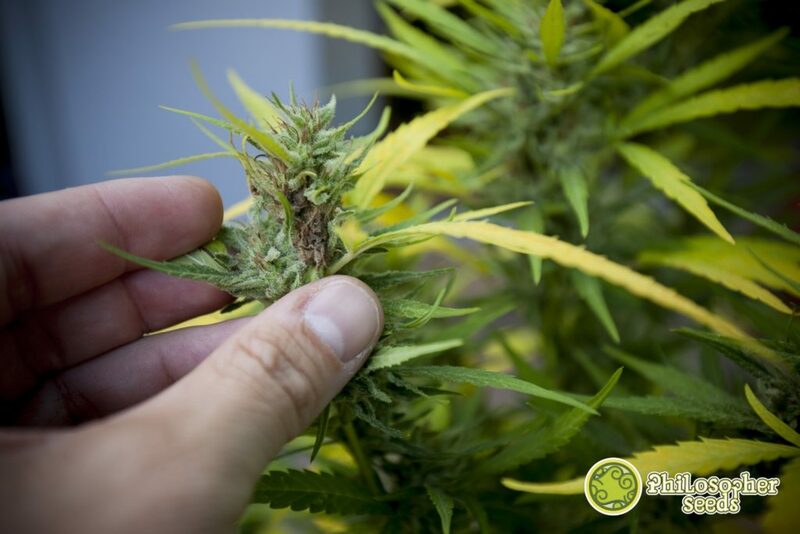 Autoflowering varieties could also be a good option when we’re looking for discretion in an outdoor grow, these plants normally grow to a smaller size with a shorter total cultivation time than normal photo-dependent varieties in regular or feminised seeds. Highly aromatic varieties are also not a great idea if we’re cultivating near to a busy place. 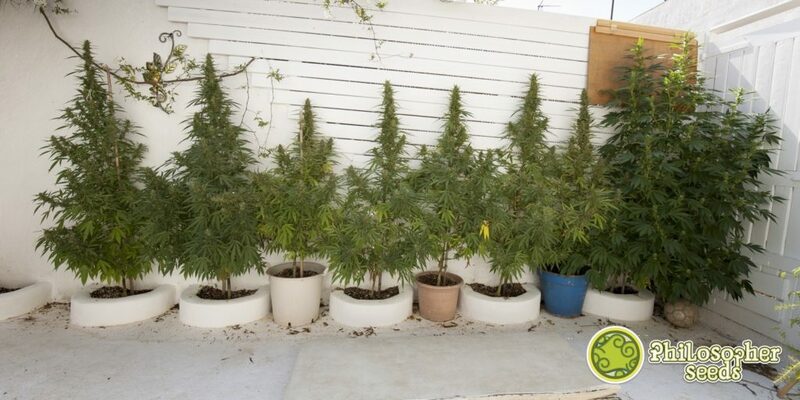 A handy resource for camouflaging an outdoor grow is to use concealment fabrics or other elements to cover and disguise the crop. The relative humidity of the air in the grow space affects how we set it up the plants. If the humidity is high and constant then we should increase the space between plants and look for varieties of cannabis that tolerate moisture, if not we run the risk of our plants becoming infected with any of the diseases caused by excess humidity, like the dreaded botrytis or grey mould. In this case we recommend the powerful and productive Easy Haze from our Classic Line, or from the Golo Line we’d suggest Spicy CBD, a great variety for therapeutic use. Both are excellent plants that are especially resistant to pathogens that thrivein high humidity conditions. Water is another crucial factor in our cultivation space. Irrigation water must be easily accessible and not chemically treated if possible. If we’re watering with water from the public supply, we recommend measuring and adjusting the pH and EC levels if possible. The moment to choose the seeds is another important moment in the planning of the crop, and of the most exciting. Taking into account the previous factors of space, we should look for varieties that fit as well as possible to the available area and environmental conditions. Environmental factors, such as the humidity we already talked about, can condition the choice of cannabis varieties that we plant. The minimum and maximum temperatures experienced in the grow area, or the hours of sunlight depending on the latitude in which we are, are also environmental conditions that can steer our hand when deciding which seeds to choose. Once we’re clear about the environmental conditions of the grow area, next we need to choose between feminised, regular or autoflowering seeds. If we don’t have much experience or don’t have much space, it’s better to choose feminised or autoflowering varieties that, besides being easy to grow, are more discreet due to their smaller size and fast flowering. 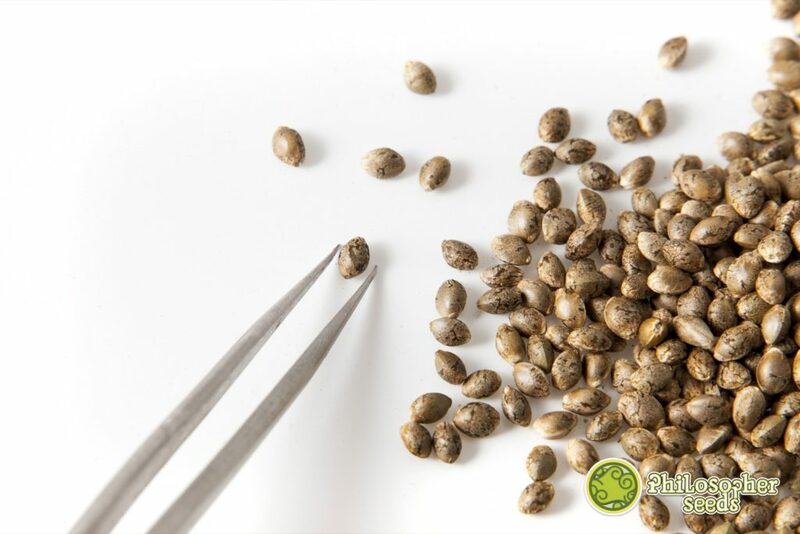 If on the other hand we have more experience growing and have enough space available to make the selection between males and females, then we can choose to sow regular cannabis seeds. Now all that remains is for us to decide details such as the flavour and aroma we’re looking for, the effect that we want from our cannabis, if we want CBD-rich therapeutic varieties, if we prioritise yieldor quality, total growing time of the crop, if we want the buds for extractions to obtain hash, etc. The difference between an outdoor growcarried out in a pot or in the ground basically lies in the growing medium, the substrate for the pot and the soil in the ground. We can buy one of the many specific substrates for growing cannabis available on the market. Commercial substrates for growing cannabis in pots are mixes of different types of peat, selected fibres, chunks of bark, perlite, etc. If they are organic substrates, as we’d highly recommend, they’ll be enriched with organic fertilisers such as earthworm humus, bone meal, bat guano, etc. These pre-fertilised substrates ensure sufficient supply of nutrients to the plant for at least 6 weeks. 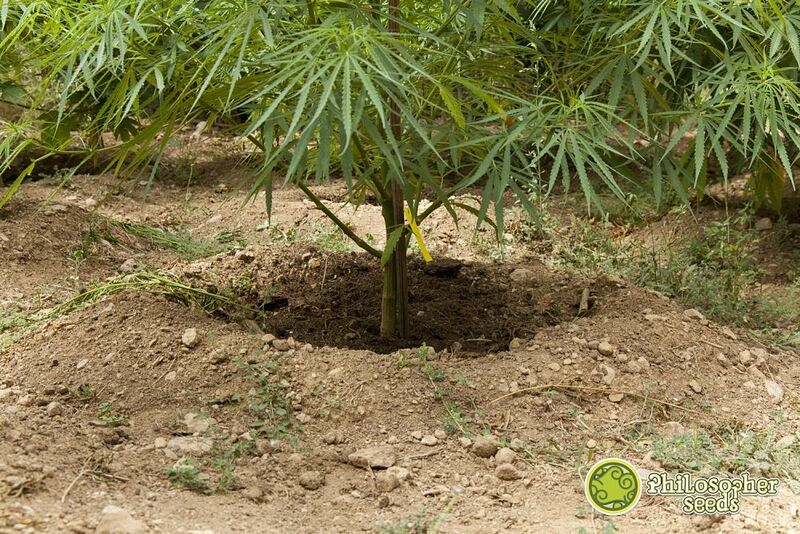 If we want to grow directly in the ground we must dig a hole about 50cm deep and 50cm in diameter for eachcannabis plant. In that hole we will add the nutrients and other elements such as fibres or plant barks and mix them with the soil taken from it to improve structure and fertility. It is worth adding a product to encourage the microbial life of the soil. Remember that before making the final transplant to the ground we will have given about 8 weeks of growth in pots counting from the germination of the seed. When we’re planting directly in the ground outdoors it’s important to regenerate the soil. 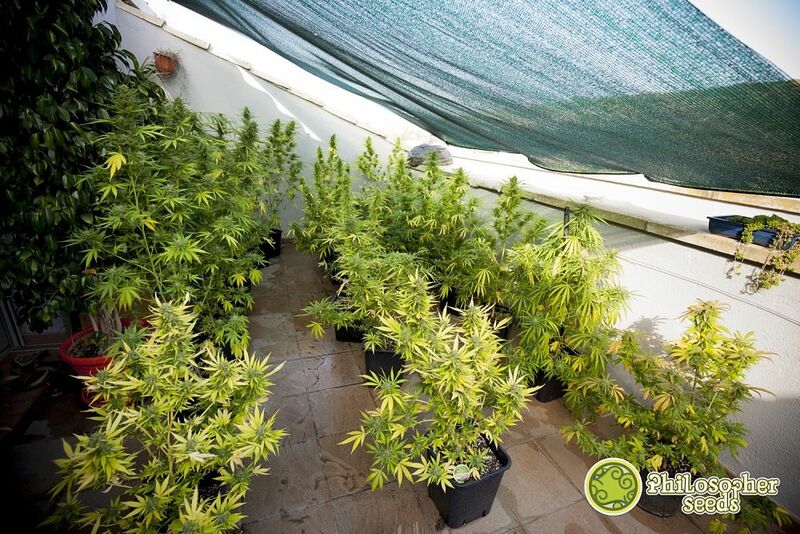 With these main fundamentals of outdoor cultivation in mind we can plan for the most common needs of the plants and foresee any possible incidents that may arise during cultivation. 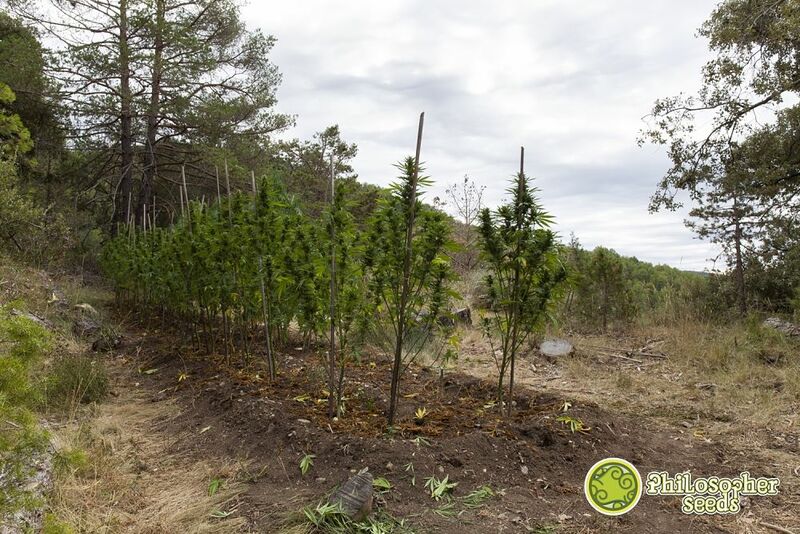 Growing cannabis outdoors is a beautiful and very satisfying process, if we plan everything properly we can enjoy the entire process, learn from it, and the planning will probably be one of the determining factors in achieving an abundant and high quality harvest. Happy growing, great harvests and good smokes! You can take a look to our blog, Marijuana Grower’s Handbook, here you can find many articles that explain you how to grow marijuana. If you use marijuana as a therapy for mitigate pain, I would recommend some of our strains in our GOLO LINE or AUTO LINE, you’ll find the good plants with interesting CBD ratio, a cannabinoid very suitable to mitigate several ailments.